Some more reader requests- Konad stamps! I know these are a little sloppy and there's pieces of cotton ball all over my nails- I had to rush a little! The base color I'm using is Color Club Pink Rush (and Power Play in a few pictures) and the Konad polish is Konad Special Polish in Black Gold. Flower, flower arch, two flowers with dots, swirly design, large flower with vines. French tips: Fishnet, animal print, hearts, flowers. Paisley design. 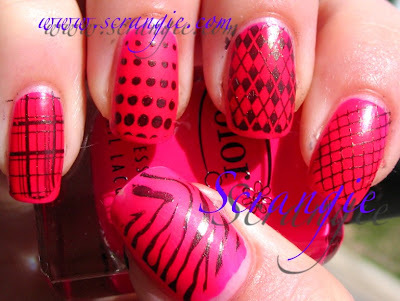 Plaid, dot gradient, argyle, fishnet, zebra. Double bows, stars, hearts, double flowers, bow with ribbon. The plate I use most often! Spider, jolly roger, scorpion, cobra, unicorn! I have tons of Konad plates, so if there's a specific plate or design you're interested in seeing, drop me a line! If I have it I'll be sure to do a picture. Konad is super fun. 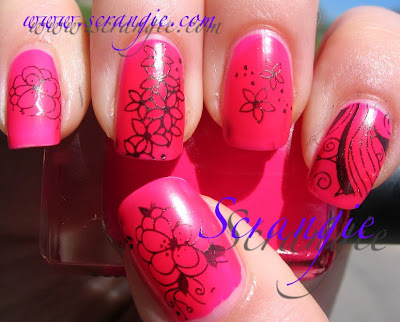 If you like nail art at all, you would really like this. I get mine from www.wowsocool.com. These are awesome! I've been debating over whether I should get a Konad Kit or not for a while now. You've convinced me I need one lol! I just have one question. 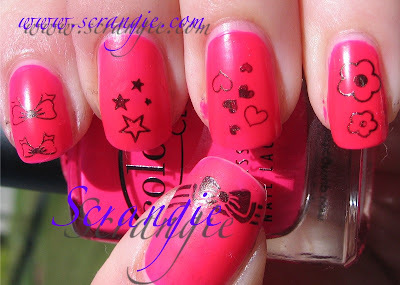 Do you have to use the Konad brand nail polish for the stamps, or could you use just regular polish? Thanks for the swatches. They're really cool! I'm so in love with konad! great pics! Wow! I am so tempted every time I see these on you or Sanna, but when push vomes to shove I am not sure I can handle them... I am such a klutz. I can't even get my nailpolish on without messing something up. But the zebra stripes... oh, how great it looks! I'm intrigued to how this works! I think it looks awesome, and I'd love to see some kind of tutorial and/or a list of things (preferably with pictures!) that are needed for these! Is it difficult? Do you need special polish? I want stamps too! oooooohhhhhh! thank you for having my request done. Do you need to use only Konad special polish or any polish will fit ? Very cool. I just ordered a couple plates and a stamper. I didn't buy the special polish, though. I hope I can work with the thicker polishes I have here. Sanna, your Konad designs always look so good, it makes me want to use mine more! Chaosophia, sure I can do that! It doesn't require much, and it's very easy to do! Nitzan, you're welcome! You can use any polish with it, but dark colors show up better. 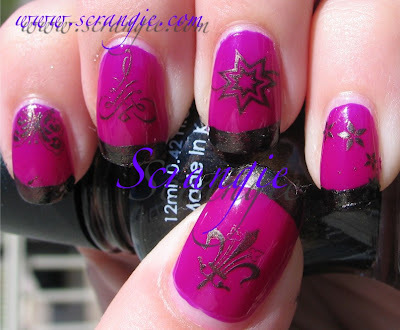 The Konad polish works best, but you don't *need* it to do the stamps! Rocketqueen, hehe I think there might be a Capricorn stamp on the zodiac plate... I'll have to go look! o0o0o these prices excite me ! where can i find all the equipment?? You put my konad pics to shame! Beautiful designs, Scrangie! You make it look so simple! I've never used Konad before but I am thinking about buying a kit. Is the stamp easy to clean? Can it be cleaned with nail polish remover?